At this half-way stage of their quarantine period, we’re really pleased with how the birds are doing. They are feeding, drinking, bathing and loafing just as they should be. When the birds arrived they were understandably a little unsettled. In the first few days whenever one of us went in to change their food, they’d become a little agitated and would run around with their heads up and alarm-calling. That’s actually quite natural behaviour for them because as humans, with our forward facing eyes, we obviously appear to them as potential predators! However, it was in contrast with Moscow Zoo, where they were settled and rather tame. This is where the CCTV we’d set up really came into its own. As you can see from the video, we can look down on the birds remotely. We’d set CCTV cameras in each of the three rooms in the quarantine station before the birds arrived and we’ve been able to watch their behaviour, without our own distracting presence. The great news is that they settled beautifully within days of their arrival, going about their “normal business” as you can see. In the CCTV footage you can see three shallow plastic “terracotta-coloured” feeding dishes. These are filled with water on which sprinkled food can float. The large dish is filled with running water from the tap via the yellow hose. Two other dishes are filled with dry food and the two smallest with soaked food. The artificial Christmas tree branches break up the 2.4 by 1.8 metres space in which the birds live and give them somewhere to get away from each other. 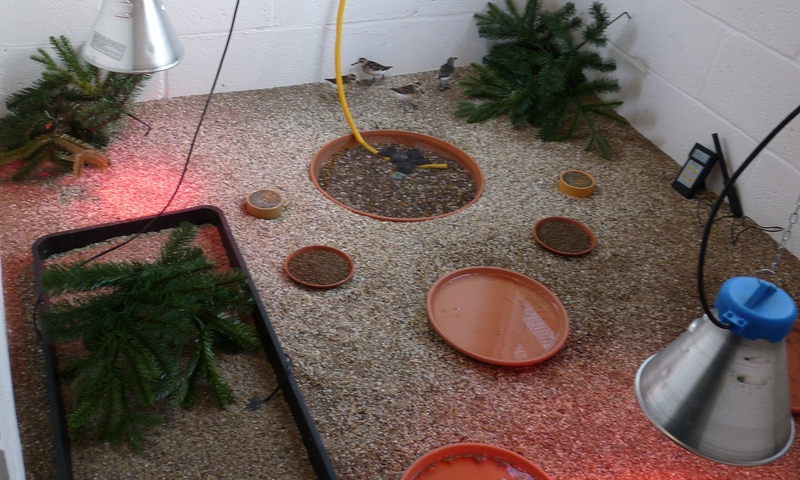 The floor is covered with river sand – an ideal substrate for the birds to walk on. The black tray contains a heat mat covered with more river sand. The room is heated to twenty degrees centigrade by fan heaters and infra-red spot lamps. The temperature and humidity is recorded by a thermo-hygrometer which you can see propped against the wall. While the birds are in quarantine, only the dedicated staff are able to see them. Not even the steering group for the project have had access. To give them a really clear view of the birds’ behaviour, I took the other short video you can see below from the birds’ eye-level. In an upcoming blog, we’ll get the Conservation Breeding Unit’s Nicky Hiscock to describe how she goes about the day-to-day care of the birds. Thanks for the post, Nige. Great to see them acting so naturally. Won’t be long before they can see the sky (I take it they’ll have some outdoor space – might be a shock for them!). Quite amazing that they’re here – bet it was hard to imagine when you set off to get them in May. Sounds so easy ‘Collecting spoon-billed sandpiper eggs to start a conservation breeding programme’ and yet it’s been such an epic journey for everyone concerned. Amazing. Aren’t these videos of Spoon-billed Sands wonderful? And very reassuring. The project’s been more successful than we could ever have dreamed – thanks to 110% commitment (and incredible attention to detail) from Nige and his team, and to the fantastic support from our partners Birds Russia and RSPB, and our colleagues from BTO, BirdLife International, ArcCona, the Spoon-billed Sandpiper Task Force and Moscow Zoo. Nige said “While the birds are in quarantine, only the dedicated staff are able to see them. Not even the steering group for the project have had access”. The Tuesday after they arrived I had an e-mail from our WWT CEO, Martin Spray, asking when he could see the Spoon-billed Sandpipers. I had the unenviable task of replying to say he couldn’t! At least not until mid-December. I know – Nige’s commitment to the birds in that tiny room in Meinypilgyno was astounding. Thanks Ken. The birds are indoors at present where it’s warm and dry. These conditions reduce the chances of the birds developing respiratory infections. As being indoors means the birds are denied the benefits of natural sunlight, each room is lit with two special bird bulbs. The bird bulbs have UV emitting phosphors to replicate the spectral pattern of sunlight and the sandpipers really do like to bask beneath, soaking up the rays! Thank you for that wish. You are right – these are special birds and we will do everything we can do ensure the species’ survival. Thank you for posting these videos and for all the work you’re doing to save this species! Nice video – it must be great to see them doing so well after all the work to get them this far. You can support this project by sponsoring my London Marathon run at justgiving.com/sandpiper. Yes, Roland, Nicky and I marvel at each bird daily. They are incredible individuals. All seem to be doing really well and as I know you appreciate, this is amazing given their phenomenal journey. WOW Nigel – thank you for choosing us to run a marathon for. RESPECT to YOU!!! Happy training. Great images of these iconic little birds. They all look so lively and involved with getting on with life! You must be so elated by this outstanding achievement and I can understand why no one is allowed to see them ‘in the feather’ as it were. It would be unthinkable if they contracted a .virulent disease from a well-wishing observer. I am happy to be patient and wait until they are less vulnerable. Looking forward to the day when I shall be able to see and hear them.for myself! Thanks again for all your painstaking work towards their survival. It is so heartwarming to see the results of your wonderful work. Thank you for sharing the news about them.